As part of Calory's setup, the app will ask your weight and other personal details, then find out if you'd like to gain, lose, or maintain your weight, after which it will calculate a caloric goal for you to strive for each day.1 I found Calory's setup flow smooth and helpful. It gets the information it needs to help the app function, and doesn't throw up any barriers to use such as asking for account creation. After a caloric goal is set, the main Calory interface is dedicated to documenting your progress throughout the day. On the main screen you'll see a large circle containing dots that increase in quantity the more calories you log, plus a horizontal line that fills in progressively, as well as the total number of calories you've logged and have remaining. There's also a big plus button for quickly logging your latest meal or snack. Here you can enter a number manually, choose from saved plates you've configured, or browse the app's food database. Like the main view, Calory's other screens are similarly simple yet practical: there's a Foods screen for browsing items you can add to your log, and a History screen to view past recordings. Calory integrates with the USDA food database, but I hope additional data sources are added in the future, as my experience finding the precise branded items I searched for was hit-and-miss. Everything in the app is well-designed from a visual standpoint, but it's also easy to understand and use. Unlike some other calorie-tracking apps I've tried, there's no extra clutter in Calory's interface – what's here is exactly what I would want to be here. For me the greatest appeal of the app is its ability to save custom 'plates' that can then be logged via Siri shortcuts. From the app's settings, you can set up plates based on food you commonly consume, and that you'll thus need to regularly log in Calory. A plate is essentially a saved food item (or group of items) that you can quickly add with one tap from the logging interface or Apple Watch app, or set up as a Siri shortcut. Using Calory's supported Siri shortcuts has been my favorite way to log saved plates. On a typical weekday I'll eat the same breakfast and lunch Monday through Friday, so with Calory I was able to save those meals as custom plates and, when I finish a meal, I can just tell Siri 'Log my breakfast' and my job is done – there's no need to open the app. 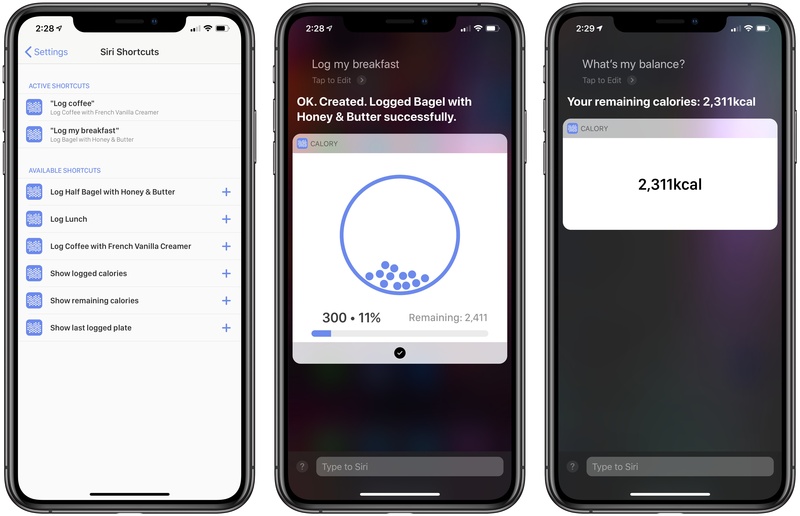 This works great on iPhone and iPad, because Calory will show you a live view of your total calorie count for the day inside the Siri interface; it also works well on HomePod, where Siri will read off the exact name of the plate you logged. A Siri shortcut is also available for the useful task of finding out how many calories you have remaining for today. All of these different shortcuts can be set up right within Calory's settings. In my experience with calorie tracking, particularly in the area of weight loss, usually the best path to success is the one with the fewest obstacles. The easier an app makes it to track calories, the more likely you'll be to actually do that tracking – and in the process, stay on top of your goals. Plus, any time you're trying to lose weight, it's best keeping food off your mind as much as possible, and Calory's approach of saving plates and logging them easily via Siri helps accomplish that. Calory enters a market dominated by complex, often subscription-driven apps that, while they can be great options for some people, they can also be more than what most users actually need. 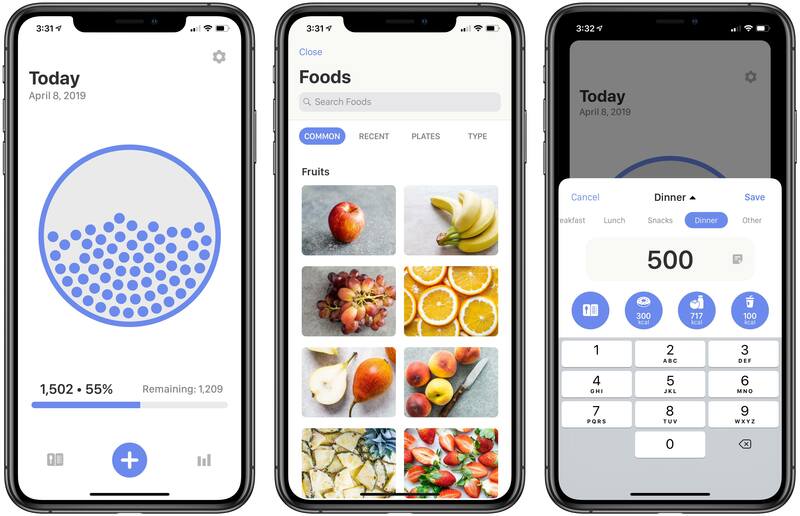 Though Calory could stand to improve its current food database, including how those results are displayed, overall it's a well-made, pleasant-to-use iOS utility that takes great advantage of the Apple ecosystem with features like Siri shortcuts and an Apple Watch app. Not to mention all the small touches that help the app feel modern, like haptic feedback, a dark mode, alternate icons, color theme options, iPad Split View, and more. If you're looking for a simple, one-time-purchase app to meet your calorie tracking needs, look no further than Calory.